This project has stitched up so quickly, it’s hardly taken any time at all! It’s probably got a lot to do with the fact that it only uses one shade of space-dyed thread for the whole design (I chose to use the Thread Gatherer Silk ‘n Colors shade ‘In the burgundy’). 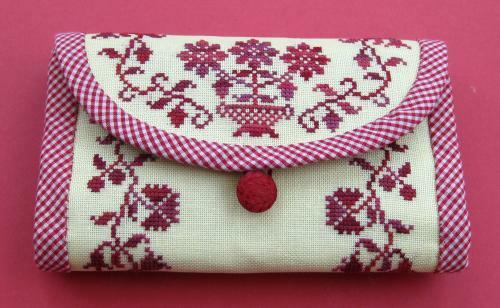 Even then, the whole design only needs one full skein to stitch both the huswif and the tiny needlebook to go inside it. 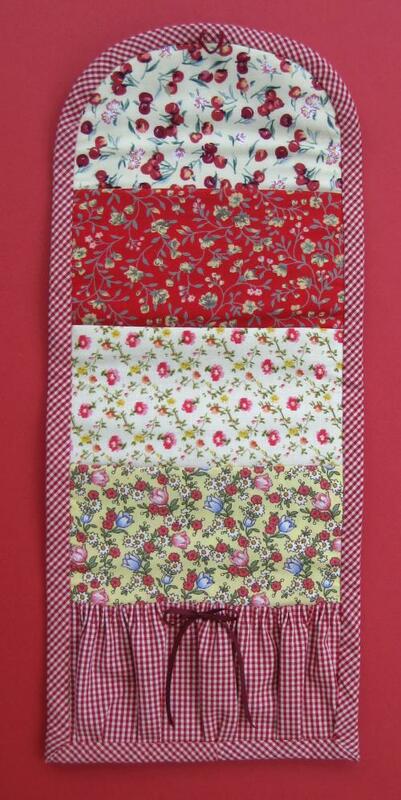 Each pocket of the huswif is made from a different small print cotton fabric (bought as a fat quarter bundle from Ebay), stitched all together into one long strip, and then folded until it’s about the length of the embroidered piece. The bottom pocket of the huswif is gathered along both long edges first, and trimmed with a bow made from 2mm braid. I had to tweak the dimensions slightly on my huswif, as I’d chosen to use a 32 count fabric rather than the suggested 36 count, so mine came out slightly bigger, but that was simple to do – I just had to widen the curved-top template a little, and allow a bit more fabric for the pockets and interlining. Then I made a ‘sandwich’ of embroidered fabric, lining, and cotton print section, before pinning the binding around the edge, and stitching it into position (this is the only part that I did by machine), and then the binding is folded over and slipstitched into place on the embroidered side. This part sounds complicated, but the instructions are really clear. 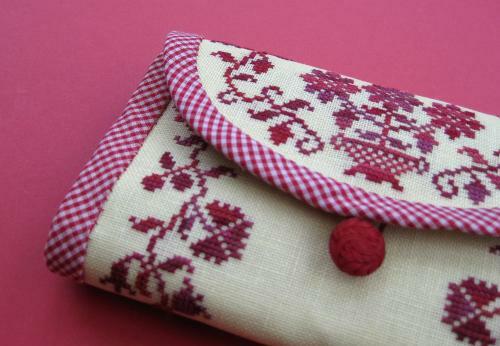 The little needlebook is made in the same way as the huswif (except that the cross stitch is done over one instead of over two). I used a piece of sunny yellow wool fabric from Weeks Dye Works for the pages in the needlebook. A button from my enormous button stash is attached to the centre of the huswif last, and a buttonhole stitch thread loop made to keep the huswif closed when it is rolled up. I’m really pleased with how this has come out. 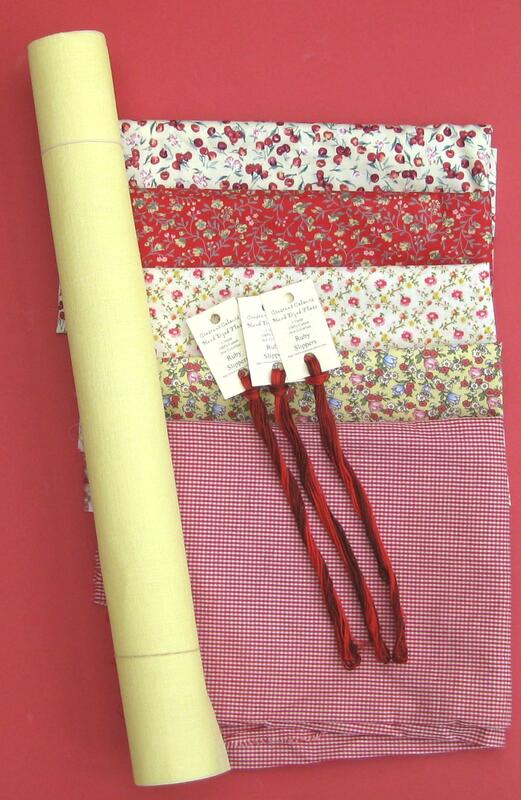 Have a look at the With My Needle website and blog for this chart pack (shown in many colourways on the blog, in photos sent in by customers), and others in the range. 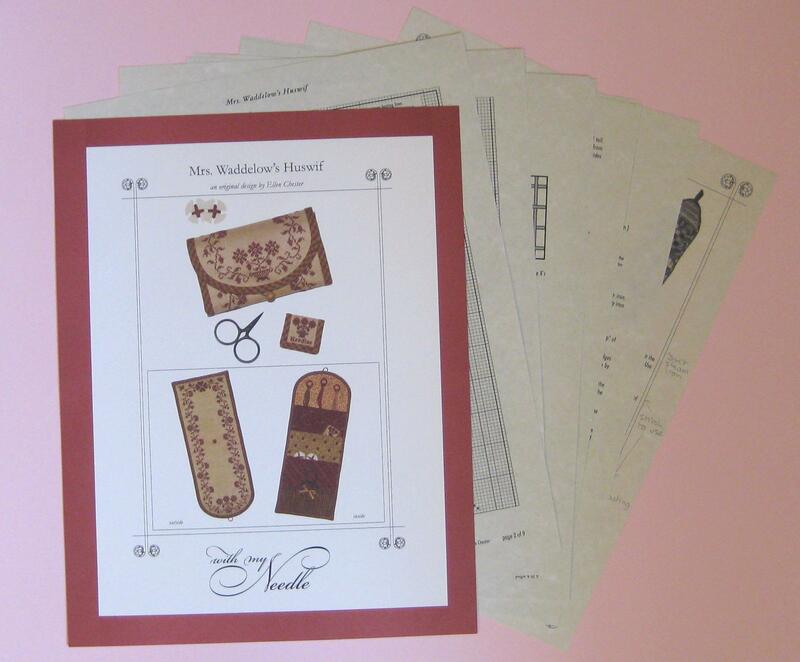 I bought the chart pack for Mrs Waddelow’s Huswif about six months ago, but it’s been lurking in my stash cupboard since then. As Ellen Chester, who runs With my Needle, told me in an email that this design stitches up quite quickly (as it’s stitched in just one shade of a hand dyed thread), I thought I’d get this one done before I start my mammoth project – Celtic Autumn – which I expect to take months. The huswif is a long length of fabric, with the cross stitch design on one side, and pockets made from five different cotton fabrics on the other. Ellen suggests that you choose your cotton fabrics first, and then find thread and evenweave fabric to match the cotton prints afterwards. 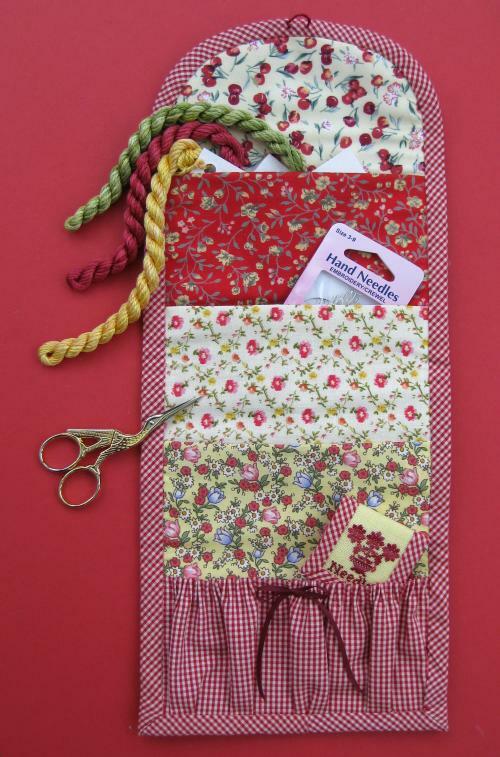 This photo shows the Crescent Colours thread ‘Ruby Slippers’, that I’d originally planned to use. 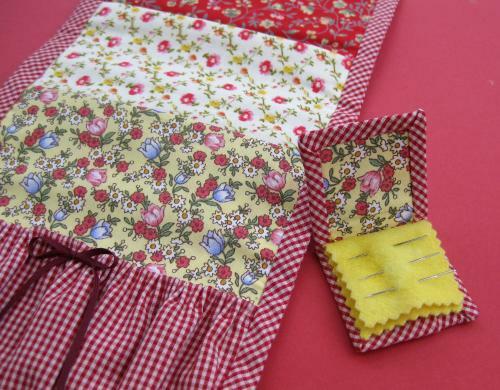 I love stitching on yellow fabric, so I bought a fat quarter bundle of cotton print fabrics on Ebay, in various shades of lemon yellow with pink/red flowers and fruits on them. I then chose some yellow 28 count Permin evenweave from Sew and So. That was the easy part. I wanted to do the stitching in a darkish purply red hand dyed thread, but there are no bricks and mortar embroidery shops near me, so I had to choose online, which is never easy. The first thread I bought was too brown, when I actually received it. So next I ordered Crescent Colours’ Ruby Slippers. But when I started to stitch with it, the variegations in the thread just seemed too coarse. Dark red, light red, dark red, light red. Very predictable. I’m sure it’s great when used on the correct project, but this wasn’t it. Before I’d got too far into this project, I had to choose something else. This is a motif from the huswif, worked in the Crescent Colours thread that I decided wasn’t right – the variegations aren’t subtle enough. I settled on a Thread Gatherer shade called ‘In the burgundy’, which was much better – uneven lengths of tones such as a plummy maroon, light purple, deep red, scarlet, mulberry….loads of colours. 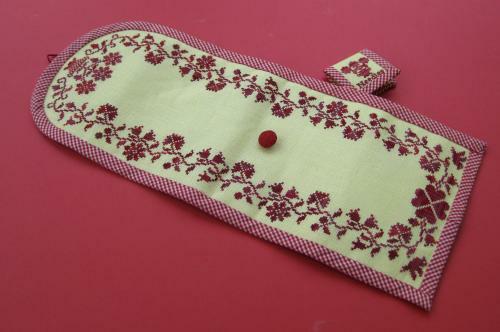 And the thread itself is great to work with – very smooth, as it’s silk. Bit pricey at nearly £6 per skein, but I only needed one skein for the whole project (the huswif itself, and a tiny needlebook). 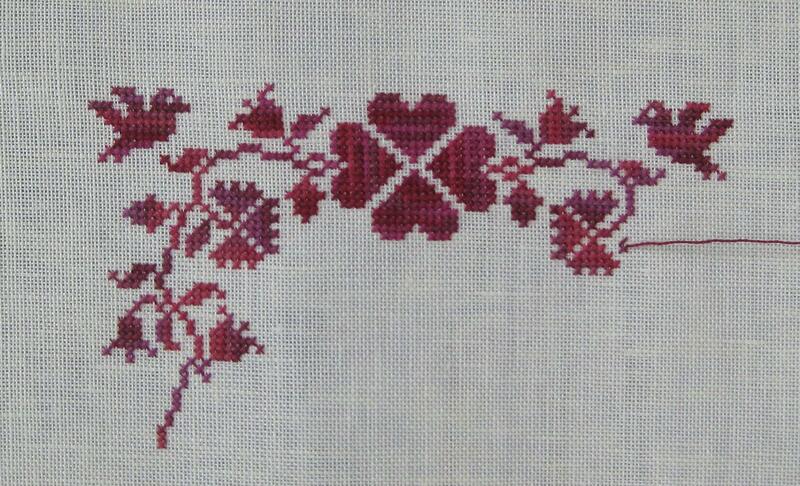 This image shows cross stitch worked with: two strands, then one strand but in ‘reversible cross stitch’, then one strand. 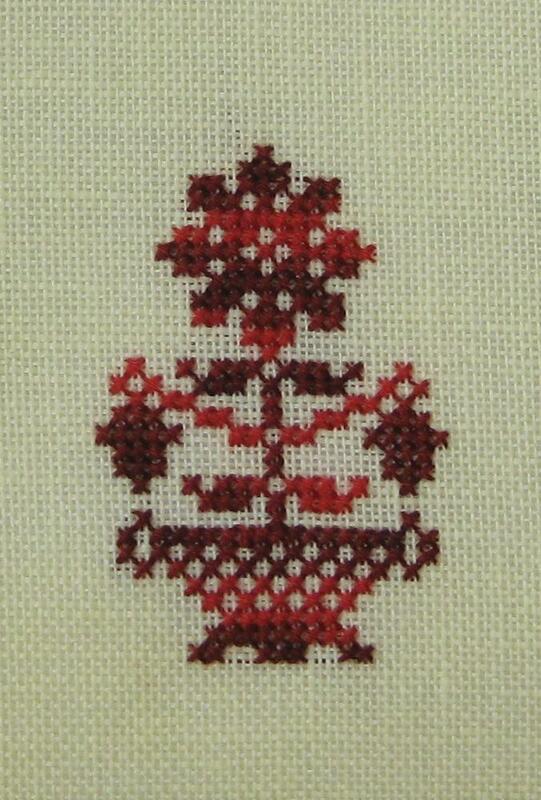 Ellen suggests that the type of cross stitch used to work this project is ‘reversible cross stitch’. I’d never heard of that. 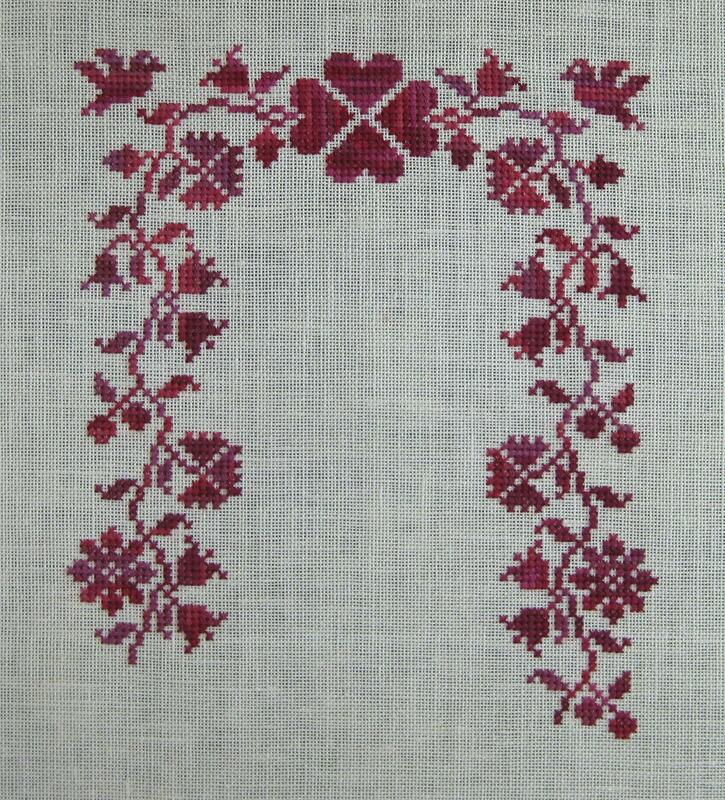 It is a stitch which looks like a normal cross stitch on the front of the fabric, and on the reverse there are crosses separated by uprights between the crosses. This is because the crosses are made with two passes from bottom left to top right, and one pass from bottom right to top left. Ellen says that when she was first stitching up this design on her fabric, one strand in the needle looked too spindly, two strands was too thick, but two passes in one direction and one in the other with one strand gave perfect coverage. Actually, I was hoping that, with the thread I’d chosen, this might not be the case, as it meant each stitch takes 50% longer to complete, but I did a quick sample, and annoyingly, she was right!! This is how much I got stitched on Saturday….